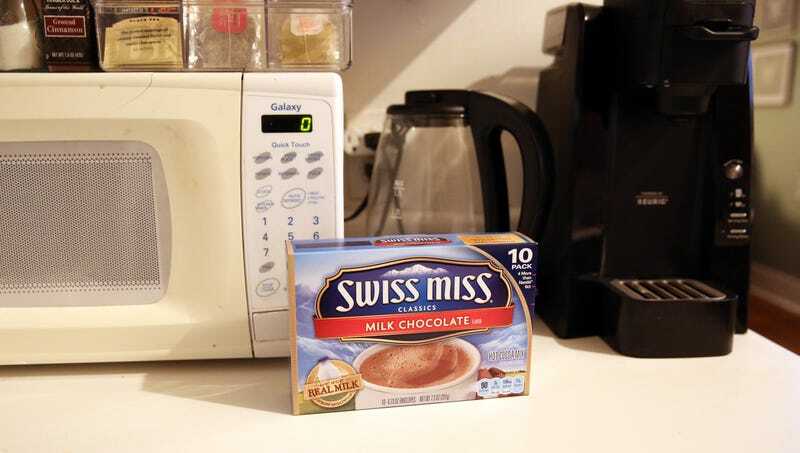 YPSILANTI, MI—Preparing to bear the brunt of the lonely winter vacation, a 10-pack of Swiss Miss hot chocolate was reportedly bracing itself Monday to shoulder the burden of holding together local man Josh Hesford’s depressing holiday alone. “Okay, it’s just me and him for the holidays, but don’t worry, you got this,” said the box of instant cocoa packets with marshmallows, adding he was confident that at least one family member would come through with a card to help ease the load. “I don’t know how much of watching Christmas movies with this sad sack I’ll be able to take, but as long as I just stay strong and do what I need to do, this will all be over before I know it.” At press time, the depleted 10-pack was ready to give up on New Year’s Eve when a bottle of whiskey arrived just in time.